Misadventures in Data Journalism | That's a Clown Hypothesis, Bro! I don’t know the technical term for this fallacy, but it’s unfortunately common for people to assert a causal link between a subpopulation A and trait B, look the incidence of B in A, and draw conclusions about the link without ever looking at B in the population that isn’t A. For instance, if you say a stock went down 5 points, that looks bad; if the whole market went down 10, that stock looks good; if companies similar to that stock went up 25, the stock looks bad. Context is key. People who work with data habitually should be pretty good at avoiding this error; teams of people, including editors, should be very good at avoiding this issue. And yet we get stuff like this Wall Street Journal. Doesn’t adjust for population growth. The New York city MSA grew by about 16% from 1990 to 2010, so that’s worth taking into account. Doesn’t account for randomness. If you picked a fake time trend and generated data from it, would it look any different? Probably not, I suspect. You should look for all of those, in particular the second and third, when people make charts like that, but again, I’m here to talk about the one that came to me first, which is that they draw this conclusion about the tristate area without looking at any national data. This doesn’t directly disprove that there’s a Mets effect, since the trends aren’t the same, but the uptick in tristate Sheas in the mid-1980s is the same as that huge jump in the national trend, and the positive trend afterwards is also seen in both datasets. So, without pretty strong corroboration, it seems wrong to assert that this is a tristate trend, and not a national trend. Does that mean it’s not Mets-related? Not necessarily, since there are Mets fans all over the country. But I would suspect that a healthy majority of them are located in those three states, and removing them doesn’t visually change the trend at all, so again, it’s pretty aggressive to attribute the relationship to the Mets. 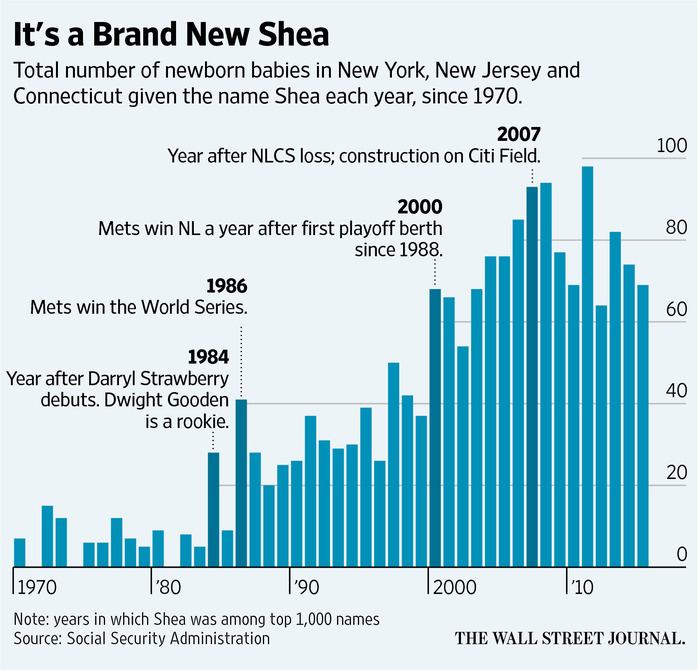 So, while the Shays ebb and flow in a way not too different from the Sheas for most of the past 30 years, there’s a persistent change in the Shea/Shay ratio right around the time the Mets got good for the first time that appears to be converging back after the close of Shea Stadium. Maybe that’s something, maybe it’s not; I didn’t adjust for gender and I don’t know what other demographic factors (e.g. ancestry) could affect this balance. My takeaway from the Shay analysis is that it provides minimal evidence for Mets fans driving Shea and some broad evidence for Shea Stadium driving the Shea/Shay ratio. What I’m interested in isn’t really whether this piece’s conclusion about Shea is accurate; more broadly, my point is that this shows the real challenges associated with publishing good empirical work in the rhythm of a daily paper or blog. For a piece like this to be high enough quality to run, the researcher has to have both the ability and the resources to take an extra couple hours (at least) thinking about and testing alternate hypotheses and doing sensitivities, and after doing that will quite likely end up with a muddier conclusion (less interesting to most readers) or a null result like this (really uninteresting to most readers). The most likely good outcome is that you get a bunch of stuff that doesn’t change your conclusion that you either cram in a footnote (hurting your style but keeping geeks like me off your back) or omit altogether (easier, but very bad professional practice). I think there’s a place for people who can use SQL and R in the newsroom; I even do some stuff like this myself. (Just tonight I did some Retrosheet queries to answer a question on Twitter, and pieces like this one about John Danks are pretty similar in concept to the Shea piece.) I really do question, though, whether trying to keep pace with the more traditional side of the newsroom is good for readers, writers, or outlets; given the guaranteed drop in both quality and relevance of the analysis, it’s hard for me to believe it’s anything but bad. I used Social Security Administration data, found here, for all of my analysis. I haven’t had a chance to clean my code up to get it on GitHub yet, but it’ll make it there soon I expect. This entry was posted in Uncategorized on July 27, 2016 by clownhypothesis.